L ocked in a battle to win the opening nominating contest next week for the election in November, the two leading presidential candidates from the Democratic Party Hillary Clinton as well as Bernie Sanders will look to gain whatever edge possible on Monday in front of droves of voters during a town hall meeting in Des Moines. The pair has similar visions yet clearly contrasting strategies. Former Secretary of State Clinton has campaigned as a pragmatic progressive who will build on the efforts of President Obama, while Sanders, a senator from the state of Vermont, has had an unexpected success by calling for nothing short of political revolution in the fight against inequality. Another Democratic hopeful, Martin O’Malley the former governor of Maryland has struggled for support in what really had become just a contest of two candidates. The Drake University town hall will have CNN moderating. 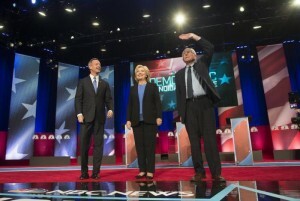 Unlike a typical form of debate, the three Democrats will not be onstage during the same time, instead they will be appearing separately to give their speech and then answer questions from the moderators and audience members. Even though the three will not be facing off directly, it will be their last time sharing a nationally televised forum at the same time. Clinton has struggled to blunt the unexpected strong showing from Senator Sanders, who has recounted his journey that started as a fringe candidate to an equal competitor during his speeches. Sanders had his audiences excited with his liberal agenda that is uncompromising, including proposals for government provided healthcare as well as raising the minimum wage to $15 per hour. Democrats dissatisfied with Clinton and the establishment have gravitated toward Sanders and his continual criticism of the inequality in the country; the result of what he said was a rigged economy of the outsized wealthy campaign donors. He faces many challenges however such as ensuring supporters’ enthusiasm turns into a strong turnout amongst supporters at the caucuses.